Hi there… My question is this: Several other libraries in the city have unlimited reserves on material so long as no one has recalled the material, why is this not Concordia’s policy? I’m a graduate student and it’s annoying to have to return a book to come and check it out again 2 days later when no one has requested my book the whole semester and I still need it. Thank you for your question. Graduate students have a 120-days loan for books and they are allowed up to 3 renewals (if no one else requests the book). This means that graduate students can have a book for up to 480 days. The reason we ask people to bring a book back to the library after 16 months is that our experience shows that people tend to misplace and lose books when they keep them a long time. When you return the book, you can re-borrow it again immediately. No need to return two days later. Reserve books are, of course, the exception. This entry was posted in borrowing, renewing on April 7, 2014 by libsuggestions. i would seriously suggest you put the word RENEWAL in the search box…that way…we could be directed…to the right link or links..and renew the books..we have borrowed…pls. advise the programmer that to go indirectly via alternative or other words does not help right now i do not know…where to click to renew…probably an anonymous name…and i am not inside the library right now..thanks..
ps. previously i did suggest to put in evidence the new library books and that suggestion was implemented on the second floor…thanks again for that follow up…. have a great day….valentine day. Thank you for your message. 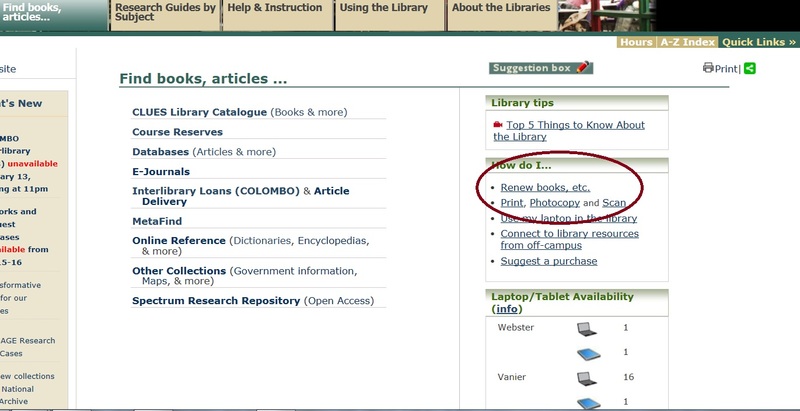 I have passed it on to our Web Services Librarian and she has added a link to our homepage, in the “How do I” box, on the right-hand side of the screen. This entry was posted in MyCLUES, renewing, web site on February 11, 2014 by libsuggestions. I agree with you. It would be great if we could renew tablets and laptops at either library. It probably would not take a quick fix to make it happen, though. 🙂 I have forwarded your suggestion to the Circulation Services Committee. Thank you for writing in. This entry was posted in laptops, renewing, returning, tablets on December 19, 2013 by libsuggestions. click…please….show it with one link…thanks. Thanks for writing in. The renew button is in your MyCLUES account. Connect to MyCLUES at: http://clues.concordia.ca/patroninfo . Once you are logged in you will see a screen like this one, with a list of items you have borrowed. Check off the title you want to renew then click on the Renew All button. Complete instructions are here. This entry was posted in borrowing, CLUES, MyCLUES, renewing on December 16, 2013 by libsuggestions.